SiteGround was founded back in 2004. But, even after 14 years, they are still at the top of the web hosting business. And, day by day they are getting more recognition. Along with providing hosting services, they also offer domain registration and other web related services. 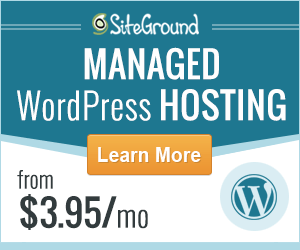 If you happen to be from Singapore and thinking about getting a hosting account with SiteGround, then you are at the right place. In this post, you will find all the necessary data regarding SiteGround. After reading this post, you will be able to make your decision about whether you should go with them or not. Is there any effect of data centers on a website? Yes, a data center can impact your website’s performance in various ways. Let’s discuss this in detail below. To simply put, you will have to use a hosting provider which has data centers from where the maximum visitors of your site come from. Let’s simplify this. For instance, if a visitor stumbles upon your site from Singapore and your website is hosted on a data center located in the USA. Then to transfer the data between your site and your site’s visitor will take longer time. This is because the distance between USA and Singapore is huge. 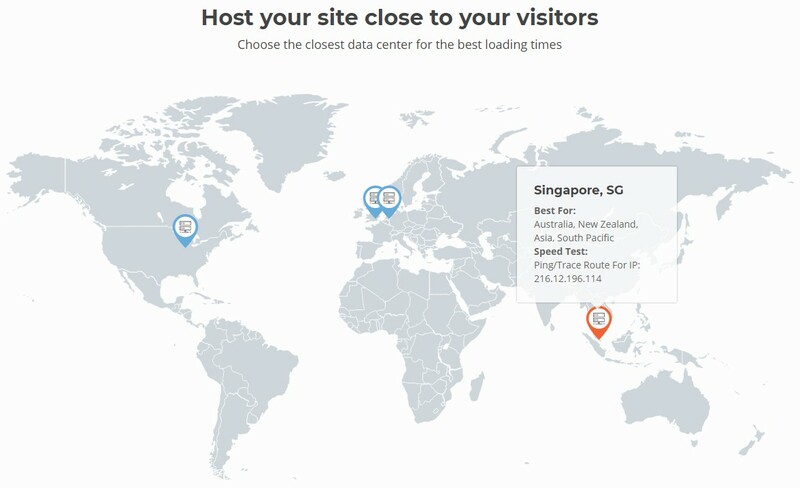 So, if you need your website to load faster for your visitors from Singapore, you will have to choose a hosting provider which has a data center in Singapore. Normally, data centers consist of different hardware. With the evolution of technology, hosting companies need to upgrade the tools and hardware of their data centers on a regular interval. In contrast, most of them don’t do that. Yes, it helps them to profit more. But, it doesn’t help us – the customers – in any way. Rather, due to old hardware, your website might get slower and even will go down from time to time. So, get a hosting company which is known for upgrading their data centers. Besides, data centers need to be equipped with adequate power sources. If that’s not the case, then the websites hosted on that particular data center will be down on a regular basis. This is not a good thing for your website. So, check the quality, infrastructure of the data centers prior to getting a hosting account. Siteground owns 4 different data centers and most importantly, one of them is located in Singapore. It is a great thing for our visitors from Singapore. SiteGround recommends that data center for any customers from Asia. However, if you receive visitors from other parts of the world you can use any of the other data centers located in the USA, United Kingdom, and the Netherlands respectively. You can see that SiteGround has covered all of the important locations. What about the quality of SiteGround data centers? SiteGround is well prepared when it comes to the quality of their data centers. They have all the latest technologies in their data centers. Plus, they upgrade the hardware on a regular interval. For example, they use SSD over HDD in all their data centers. Using SSD over HDD can raise the speed of page load of your website by about 20 times. Along with that, SiteGround has multiple power feeds supplying power to each of their data centers. They are also prepared for the worst case scenario. You don’t know when something will go wrong. So, they are prepared with generators and UPS of their own as backup power sources. With all these useful features, you can put your trust on SiteGround without any hesitation. This will be a page loading speed test. For conducting the test on SiteGround, we require a website hosted on SiteGround. And, we have one. This website (ReviewPlan.com) is hosted on Siteground. Plus, we are using the Chicago data center to host our website. So, let’s get to know in detail about this experiment. What’s up with this page load speed test? This page load speed test will be performed with the aid of Pingdom. For this test, they have 4 test servers on different locations of the world. Those locations are New York City (USA), Stockholm (Sweden), Melbourne (Australia), and California (USA). Because this article is particularly indented towards our readers from Singapore, we will have to use the neighboring server from Singapore to test. And, the Australian server is the closest one in this case. So, we will utilize that server to conduct this test. What will we get to know from this test result? From this test, we will be able to know the time it takes to load our website completely. The ‘Load Time’ will be the indicator of that. If the ‘Load Time’ is lower then the site will load faster for the visitors. However, as our website is hosted in the USA, it is quite possible that the loading speed from Australia won’t be that good. Despite that, we will conduct the test for you. The standard load time is around or below 2 seconds for any website. Yet, it is great, if the load time is lower. The performance grade is B and we have got 89 out of 100. Here, the test website took 2.63 seconds to load completely from the Australian server. This is around the standard load time. So, even though our website uses the USA server of SiteGround, it has done well from the Australian server. To get a more accurate representation of the performance of SiteGround, we should run a second test from any of the USA servers of Pingdom. As the distance between our website’s server and the Pingdom’s USA test server won’t be that great, we believe we will be able to show you the real performance of SiteGround by doing that. Now, we are using the San Jose server of Pingdom. Now, the performance grade has improved. We have achieved an A (highest grade) here. Now, let’s know the most important data from this test. Again, our load time also improved by a lot. In this case, ReviewPlan.com was loaded completely on the USA server in just 829 ms. Astonishing! This is a clear indication of the good performance of SiteGround. More importantly, it shows that you need to use a web host company which has data centers closer to the majority of your visitors. This is a test where we will find out if our web host’s server is faster or slower. Let’s know more about this. 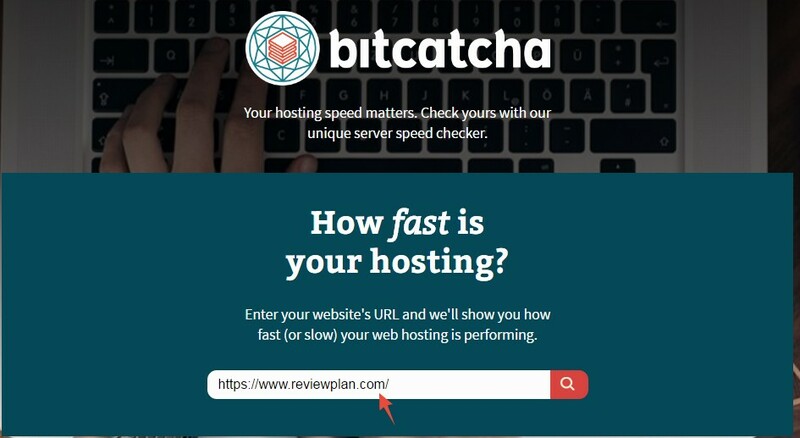 We will be getting help from another website named Bitcatcha to conduct this test. This is a website which has 8 test servers all over the world. All of those test servers will send a request to our test site’s server. In return, our site will respond to it. If the server of SiteGround is up to the mark, then it will be able to respond faster. As they have 8 servers, we will receive 8 different ‘Response Time’ from the result. Now, as you may have already guessed that not all of those are important to us. In this case, we will be keeping our eyes on the result of the Sydney & Singapore servers. As these are the nearest ones to Singapore. What could be a good response time? We know that we will get to know the server response time from this test. But, how much is too much? Unfortunately, there is not any straightforward answer to this. Yes, Google has a recommendation for it. They suggest that if the response time is lower than 200 ms, it is good for you. So, let’s look at our result. In this test, we have achieved ‘A+’ as the performance grade. This is the best grade. First of all, it took only 73 ms to response for SiteGround’s server to the Singapore test server. And, for the Sydney test server, it took just 189 ms.
From the result, it’s pretty clear that Siteground has some great servers. As all the response times were below the recommendation of Google (200 ms). If you receive visitors from other parts of the world, you can take a look at the other results too. At this point, we will conduct the last test. Details on the Ping test? For this one, we will use the ping tool from the website Keycdn. This is a site which has 16 test servers on different locations of the world. Using this experiment, we will get to know the quality and ability of the server of our website i.e. the servers of SiteGround. As before, we will use ReviewPlan.com as the test subject. Although we will have 16 different results, we don’t need all of them for this post. As for our readers from Singapore, we will be keeping our eyes on the results of Singapore, Taipei, and Sydney servers. As always, this ReviewPlan.com website is the test subject. First of all, we will take a look at the ‘Ping Time’ of the Singapore server. And, it is only 68.500 ms. The other two ping times from Sydney and Taipei are 113.449 ms and 49.121 ms respectively. From the result, we can see that there’s no packet loss on any of the servers. All are at 0%. That is excellent. What do we think about the test results? After conducting 3 different tests, we can now analyze them. From the first test, you can see that SiteGround has done very well in maintaining a very fast load speed for our website. Even though the result from the Australian test server was not that good. We have seen the result from American test server was top-notch. Later, we have also put the servers of SiteGround to test. On both occasions, SiteGround has shown integrity and performed flawlessly. So, it should not be hard to choose SiteGround for your website if you’re from Singapore. On top of that, SiteGround has a data center within your country. So, if you receive visitors from Singapore, your best bet is to host your site on that data center of SiteGround. What else to do to improve the performance of your website? If you receive visitors/readers from different parts of the world on your website, then it becomes hard to assist all of your visitors evenly. As you know the loading speed varies from place to place depending on the location of your website’s data center and the visitors. In order to serve your site visitors from all corners of the world, you will need to use a CDN service. By using a CDN (Content Delivery Network) service you will be able to store your website on multiple servers all around the world at once. That way, when visitors will browse your website from different locations of the world, they will be served with your website’s content from the closest server to them. Ultimately, your website will load faster to all of your website visitors. For serving all of our international visitors, we also use Sucuri CDN for ReveiwPlan.com. They are well known for their CDN service. However, they also have some other useful services for the website owners. Sucuri has 11 data centers. So, when you use their CDN service, your site will be on all of those data centers simultaneously. They claim that your website’s load time may increase up to 70% after using their CDN service. We can attest to that. You should take regular backup of your website. If you don’t, your website’s contents are at risk of being lost. So, you should take care of that. However, we know that it is not easy to take backup of our website regularly. So, to make the process easy, Sucuri offers this backup service. Once you set it up, you will not have to worry about backing up anymore. It has both automatic and manual backup system. You should also think about securing your website seriously. As you know, there are hundreds and thousands of websites are being compromised daily. So, you need to use strong security measures to keep your website safe. For this reason, Sucuri offers their firewall service. It is also a ‘set it, forget it’ service. Even if you are not a professional or a techy person, you don’t have to worry about that. After setting it up, Sucuri will take care of your website’s security from that time onwards. Whenever you want to decide on getting a new hosting account. 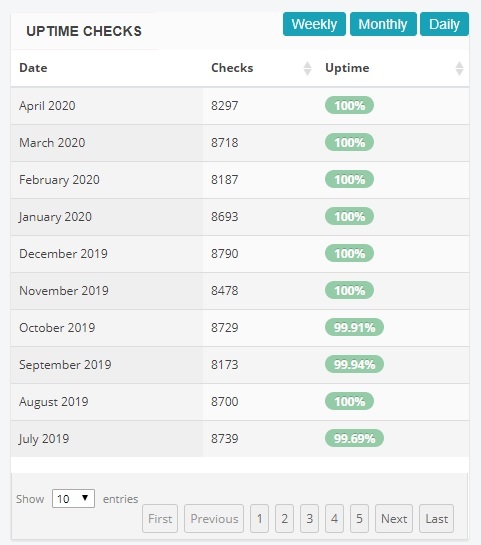 You need to check the uptime record of that particular web hosting company beforehand. Most of the time, you will find that the hosting companies boast about their 99%+ uptime record on their own website. Don’t be fooled by that. It doesn’t matter what they advertise on their website. If you can get a report from a real user of that specific hosting company, then you can believe that. Even in the case of SiteGround, it’s not different. Fortunately, we are a long time user of SiteGround. And, we also keep monitoring the uptime and downtime of our website regularly. So, for you, we will share the uptime record of our website. The uptime record of our website for you. You can easily judge the performance of SiteGround if you follow the image above carefully. It is clear that SiteGround has performed very well. First of all, they don’t have any months where they were below 99%. And, on the other hand, they have managed to keep 100% uptime for most of the months. It actually shows that SiteGround is a very reliable hosting company. And, they have always kept the industry-standard 99%+ uptime without any problem. Along with that, SiteGround has pro-active server monitoring system. With this advanced technology, they can detect any server side problems as soon as possible and then can solve them within a moment. That’s not the end, this system can even predict if any problems are going to occur before even happening. So, they can take proper steps to prevent those server sided problems from happening. That’s why SiteGround can maintain 99%+ uptime on all of their customer’s website. Until this moment, we have talked about the performance and quality of SiteGround. However, you need to know all about the support system of a company before you choose them. So, for your convenience, we will now let you know about our experience with them. We are using SiteGround for a long time. But, we need to admit that, we haven’t faced many difficulties during that period. But, whenever we required any assistance, we always contacted the SiteGround support team. Every time, we were answered instantly and the customer representatives were very helpful. But, the most important thing about them was that they are all professional. So, they know what your problem is and how to solve that problem without any hassles. You can find them 24/7 all around the year. So, your country or time zone is not a problem at all. Yet, if you are not from those areas, you have other options too. You can use any one of the 3 methods below to communicate with them. If you are in a hurry, you can use ‘Live Chat’ or the ‘direct phone’ option. Using both of these methods, you will receive an instant response from them. Or if you can wait, use the ‘Ticket’ system. You will get a reply within 10 minutes. We were very satisfied with their customer service. They always try their best to solve your problem even if they need to go the extra miles. Conclusion: Should you go with SiteGround if you are from Singapore? 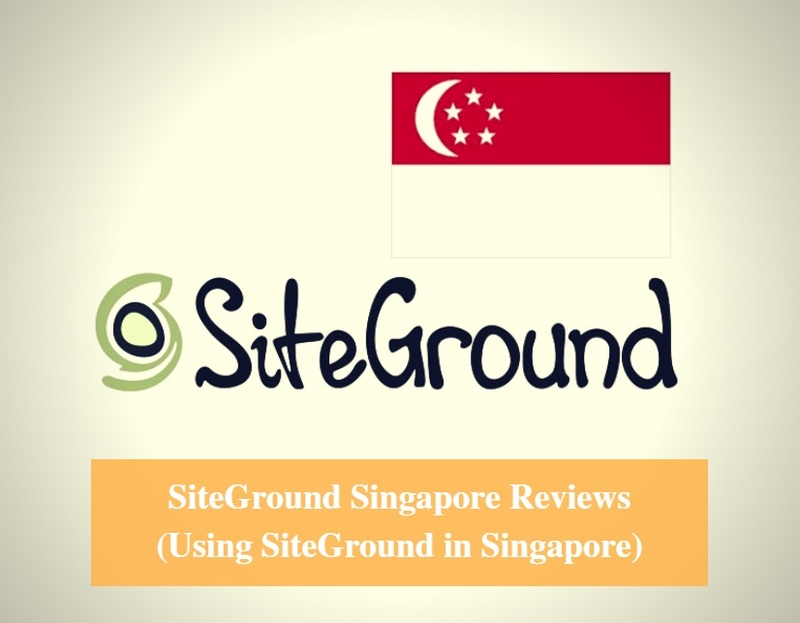 There a lot of reasons to choose Siteground as your website host if you are from Singapore. Among them, the most important one is the location of their data center. As you already know they have a data center in Singapore. So, it will be very helpful for your website and visitors, if you choose that data center to host your site. On top of that, Joomla, WordPress, and Drupal officially recommend SiteGround. So, you can go with them without any hesitation. Even after that, if you are still unsure, here’s our 2 cents, we have used SiteGround for a long time. And, we wholeheartedly recommend them to our readers from Singapore. You won’t go wrong choosing SiteGround.